The person who thought of this has my undying gratitude. Strawberries are plenty good all on their own but when you roast them, magical things happen. Just like roasting vegetables, heat from the oven brings out the sweetness and caramelizes the juices. Sweeter and juicer strawberries? That’s perfectly fine with me! Just a couple of miles from our house is the area where most of the strawberries are grown in Florida. They even have a Strawberry Festival every year complete with a Strawberry Queen! 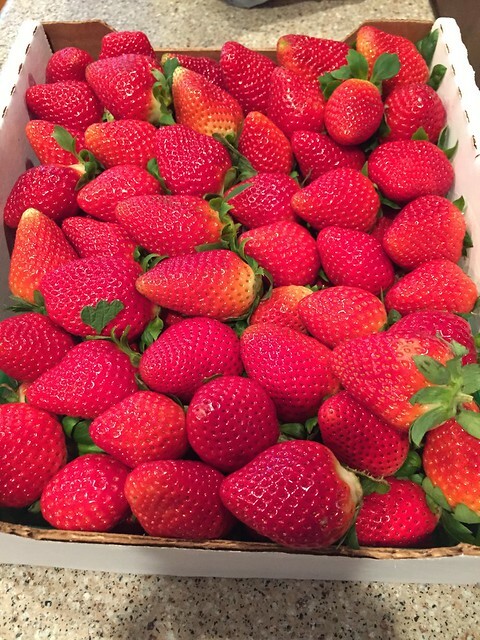 Unlike the other parts of the country that have ripe strawberries in the summer, we have strawberries in the winter. In fact, they are ripe and in abundance right now. That big box of strawberries? Five bucks. Yes, you read that correctly. And they were perfectly ripe, red and delicious all the way through. Once you experience roasted strawberries, I promise you won’t need any more convincing. 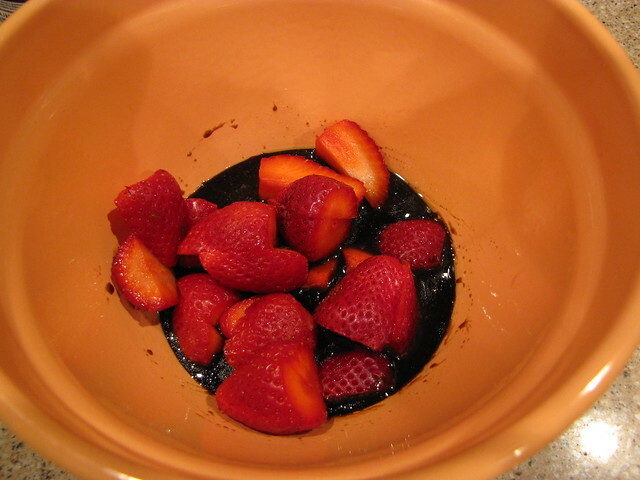 Strawberries, Maple Syrup, Balsamic Reduction, Olive Oil, and Salt. The original recipe calls for balsamic vinegar (a few drops) and port wine (which I was out of) so I got out my trusty bottle of Balsamic Reduction/Syrup from Trader Joe’s. 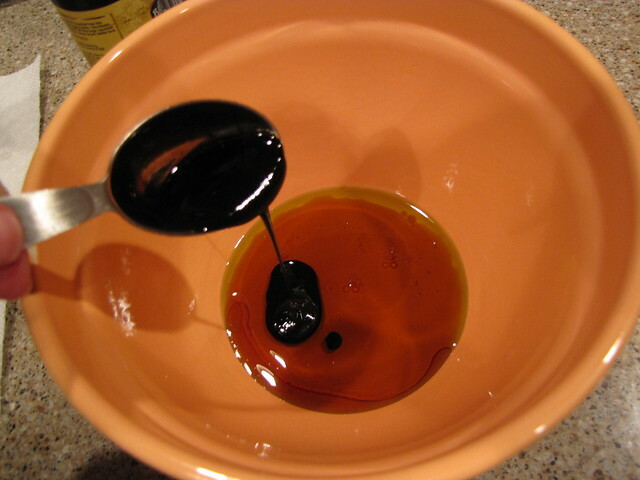 Grab a bowl big enough to accommodate your berries and add 3 Tablespoons of maple syrup, 2 Tablespoons of olive oil, and 2 Tablespoons balsamic reduction. Add a pinch of salt and whisk to combine. Rinse and dry 1 to 1½ pounds of strawberries. (About 3 full pints.) Get them as dry as possible for better roasting. Note: Next time I make this, I am making a double recipe. This made 4 modest portions but we could have happily eaten more. It will also keep in the fridge for up to a week. Remove the stem and hull (little hard part under the stem) from the berries and cut them in half or into quarters if they are large. Carefully stir the strawberries into the syrup mixture until well coated then pour them out onto a baking sheet that has been lined with parchment paper. Be SURE to use a baking sheet that has sides or some other baking dish and not a flat cookie tray or you will have a mess in your oven. 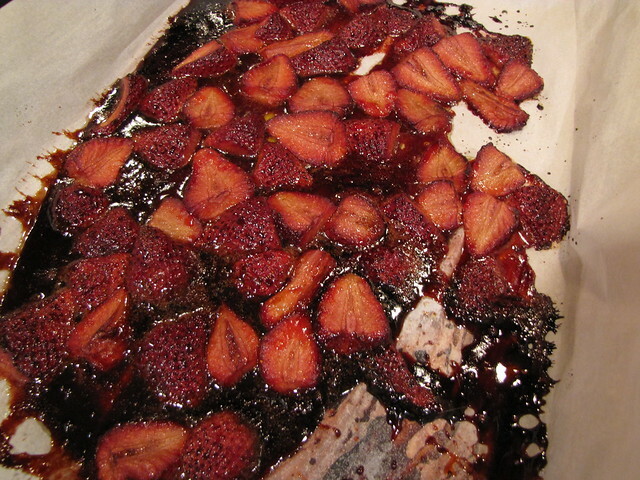 Roast the strawberries in a 350 degree oven for 30-40 minutes. Five minutes into this process your house will smell AMAZING! 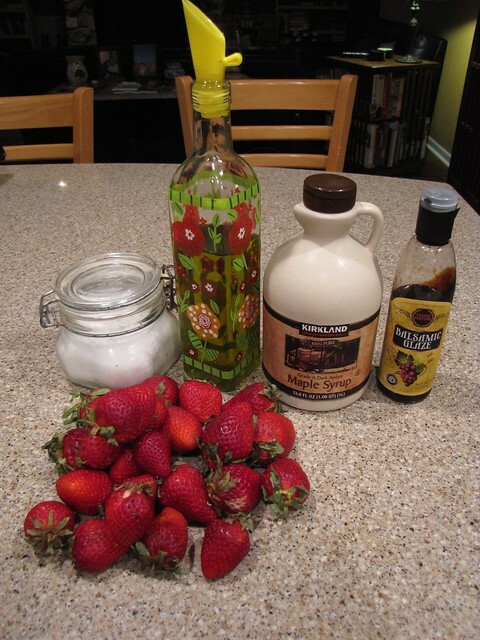 Forget those apple pie candles, give me roasted strawberry scent. 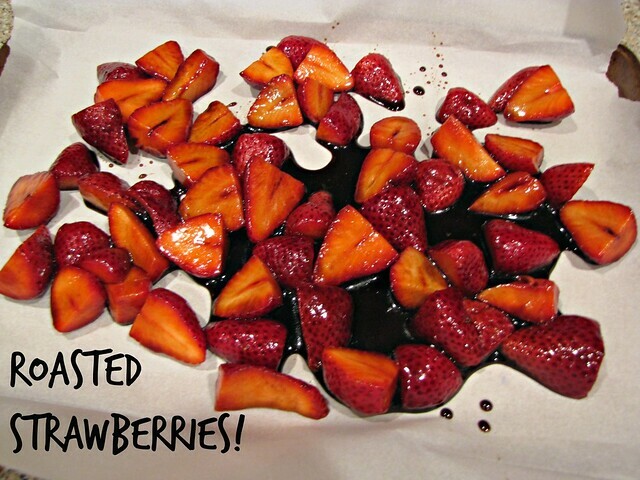 While the roasted strawberries are still warm, scoop them off the parchment paper and into a bowl or container. Stand right there and eat them with a spoon. 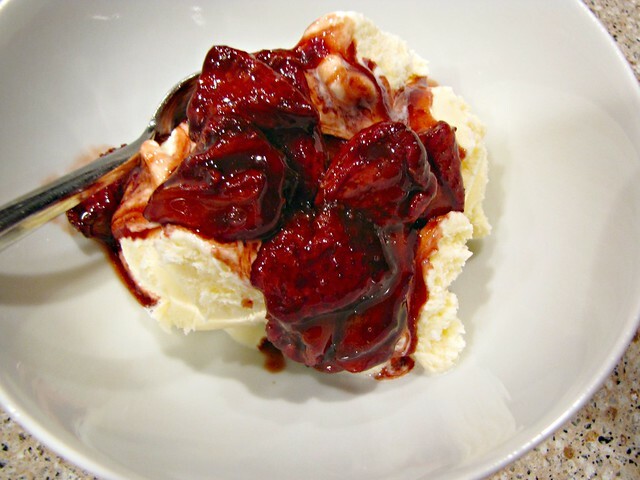 OR get a bowl of really good vanilla ice cream and top it with the roasted berries. These would make the most decadent strawberry shortcake. I can’t even imagine how good that would be. I have plans to make this almond cake next week and top each slice with some of the roasted strawberries. I’m also pretty sure there has to be some sort of flourless chocolate cake roasted strawberry concoction happening here very soon. Healthier options (other than the aforementioned eating with a spoon) would include topping oatmeal or yogurt with a nice spoonful of roasted strawberries. So many roasted strawberry options. I’m going to need another box of berries before the season is over! It’s funny that I found this recipe through the internet even though I own this cookbook. Apparently the genius behind roasting strawberries is Heidi Swanson! I have many other recipes bookmarked to try so we will definitely be seeing this cookbook again. Cannot wait to try this! Thank you again for loving cooking! I did a nice salmon using a drizzle of soy sauce, chopped scallions, a sprinkle of ginger, thin slices of lemons and bake for 25 min. At 350 degrees. Yum! That salmon sounds delicious! I’ll definitely give it a try now that good, wild salmon is back in season. Thanks for the great idea!